Sign at Prudence Crandall's female boarding school in Canterbury, CT; photo by Howard Stanbury on Flickr (noncommercial use permitted with attribution / share alike). Prudence Crandall (1803-1890) was designated the official state heroine of Connecticut in 1995 as a symbol of courage for her stand against prejudice. 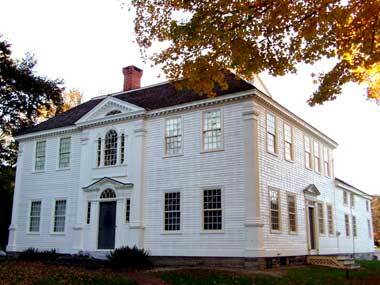 Prudence Crandall established the first academy for African-American women in New England in 1833. For this audacity she and her students faced hardships and violence during its 18 months of operation. 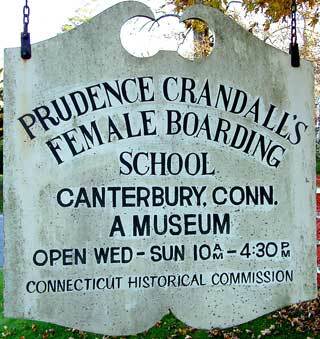 "Prudence Crandall (1803-1890) opened an academy on the Canterbury Green in 1831 to educate daughters of wealthy local families. The school was extremely successful until the following fall when she admitted Sarah Harris, a 20-year-old black woman. Sarah had hoped to become a teacher with the help of the education the academy could provide. Reflecting the attitudes of the times, Sarah's admittance to the academy led parents to withdraw their daughters.Miss Crandall made contacts throughout the northeast's free black communities to attract young black women students. They came from as far away as Boston, New York City, and Philadelphia. The State responded by passing the "Black Law" which made it illegal for Miss Crandall to operate her school. Miss Crandall was arrested, spent a night in jail, and faced three court trials. The case was dismissed in July of 1834. Two months later a mob attacked the school, forcing Miss Crandall to close. The courage shown by Miss Crandall, our State's official heroine, features prominently in civil rights history. The "Black Law" was repealed in 1838." 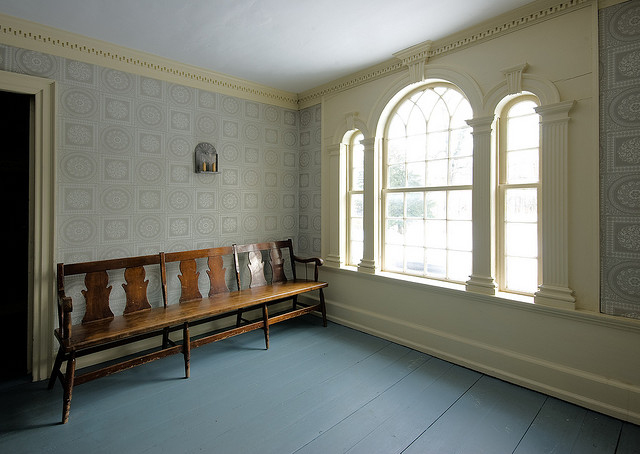 Prudence Crandall museum in Canterbury, CT; photo by wildeflowers on Flickr (noncommercial use permitted with attribution / share alike). Prudence Crandall's female boarding school in Canterbury, CT; photo by Howard Stanbury on Flickr (noncommercial use permitted with attribution / share alike).